"What is Past is Prologue," are wise words of Shakespeare carved on the stone wall entrance to the beautiful Archives Building at our national Capitol. "Study the Past," are words equally significant carved on the opposite wall. In a strict sense, all events since the beginning of time up to this very moment are prologue. So it is history that sets the stage for tomorrow. On this premise, THE ASSOCIATION OF RETIRED CONSERVATIONISTS was founded. Sixteen years prior to this Bicentennial Year of the Declaration of Independence, THE ASSOCIATION OF RETIRED CONSERVATIONISTS, was born. Conceived by C.L. Harrington in May, 1960, it began as a “kaffe klatsch” with Clarence Bontly. Meeting at irregular times they enjoyed reliving their years with the Wisconsin Conservation Department. Shortly thereafter, Joe Alexander and Ed Line joined the twosome. Then C. L. invited Juel Anderson	and Russ Williams to meet with them. They did. In time, other retired conservationists met with the group. Automobile trips to places of interest followed. Soon, ten to fifteen retirees were meeting for coffee and enjoying a half—hour or so of chit—chat. 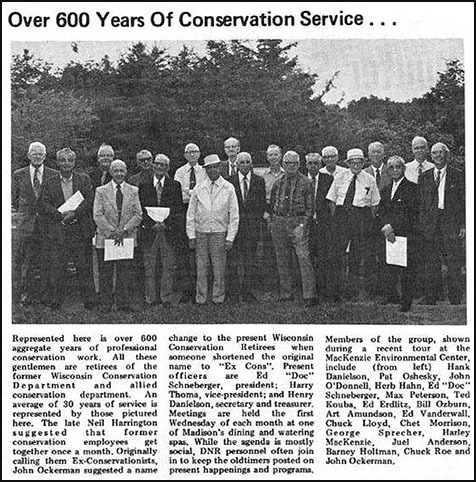 When Edward Erdlitz suggested a name for the group, THE ASSOCIATION OF RETIRED CONSERVATIONISTS, it was	accepted and monthly meetings followed. As is true with many worthy organizations, THE ASSOCIATION OF RETIRED CONSERVATIONISTS, rose from humble beginnings. Actually, the Association is dedicated to the friendship and good fellowship of conservationists no longer on active duty. Noon get—togethers for lunch are scheduled on the first Wednesday of each month at various eating places in and around Madison. Speakers on timely subjects of interest and concern to members keep the group alert and informed. Membership in, THE ASSOCIATION OF RETIRED CONSERVATIONISTS, is limited to retired gentlemen who meet the qualifications and standards of good character. The Organization affords members an opportunity to register group action in natural resource functions. Officers are President, Vice President, Secretary—Treasurer, and Coordinator, chosen annually. Current members are largely from the Wisconsin Department of Natural Resources formerly the Wisconsin Conservation Departments), and the Forest Service and Soil Conservation Service of the United States Department of Agriculture. THE ASSOCIATION OF RETIRED CONSERVATIONISTS, is not a secret organization. Members graciously proclaim bonds of professional interests in conservation: and kindness, honesty, and good will. Expertise in diverse fields, the Association proudly proclaims 45 active and 5 inactive members, totaling 1,558 man-years of professional career service in natural resource activities. Independent now of those directing public programs, we are free to pass judgment on and register individual and group responses on the wise use or misuse of our renewable and nonrenewable natural resources. Thus, THE ASSOCIATION OF RETIRED CONSERVATIONISTS, is in a position to support programs and objectives which in its judgment are beneficial to sound management. Practices and legislation considered detrimental to effective conservation, the Association will oppose. As members of, THE ASSOCIATION OF RETIRED CONSERVATIONISTS, we pride ourselves in being loyal conservationists. By the same token, we consider our greatest responsibility is being honorable citizens of the United States of America. As reflected in the “HISTORY OF THE ASSOCIATION OF RETIRED CONSERVATIONIST'S" that was signed by the officers of the association on May 5, 1976, the Association of Retired Conservationists was created to proclaim and promote the professional interest in conservation that its members shared. Undoubtedly, another reason for the existence of the association was that it allowed people who had worked together during their careers to continue to socialize after retirement. At the time that the "HISTORY OF THE ASSOCIATION OF RETIRED CONSERVATIONISTS" was written in 1976, the members described themselves as "retired gentlemen . . . of good character" who had previously worked for the Wisconsin Conservation Department, the Wisconsin Department of Natural Resources, the U.S. Forest Service or the Soil Conservation Service of the U.S. Department of Agriculture. Since that time, members have been admitted to the association who worked for other government agencies or have had other conservation-related careers, and two women have been aided to the membership role. the fee to be decided by majority vote of the members). It is the intention of the members of the Association of Retired Conservationists to continue to emphasize the associations desire and responsibility to evaluate proposed legislation and other policy questions that have the potential to affect our natural environment, and to register our position on natural resource-related issues, both as a group and individually, in order to foster better stewardship of our natural resources. August 2004 Resolution: A motion was passed to only allow the release of the ARC membership mailing list after a request for our mailing list has been presented to our members at a regular monthly meeting and has been approved by a vote of those in attendance (except that we will provide our mailing list to other Wisconsin DNR retiree groups, if requested, without a prior vote). January 2006 Resolution: A motion was adopted to provide that members who had paid for the cost of the winter holiday party in advance, but who were unable to attend and cancelled their reservation a week or more in advance, would be reimbursed. January 2007 Resolution: The January 2006 resolution, regarding reimbursement of payments received for the winter holiday party, was amended by the adoption of a motion to also reimburse members who had prepaid, were unable to attend, but did not cancel their reservation in advance if the restaurant does not charge ARC for their meals. August 2007 Resolution: A motion was passed authorizing ARC officers to testify at public hearings and otherwise report that ARC supports the appointment of the DNR Secretary by the Natural Resources Board and the appointment of an independent public intervenor. March 2008 Resolutions: (1) The members adopted a policy that if the Madison Public Schools are closed due to bad weather on the date of ARC’s regularly scheduled monthly meeting, our meeting will be cancelled as well. Members were advised to check local television stations on days with questionable weather, to see if the Madison Public Schools are closed. (2) A resolution was adopted to send a memorial donation of $75 from the ARC treasury to their family whenever an ARC member passes away, instead of passing a hat for donations as was done in the past. The membership approved adding a surcharge to the cost of our lunches at our monthly meetings, in order to generate funds for this purpose. October 2008 Resolution: The members voted to support legislation that would provide for the appointment of the DNR Secretary by the Natural Resources Board and authorized ARC officers to testify before legislative committees regarding the organization’s support for this proposal. January 2009 Resolution: A motion was passed to include a food drive (to collect non-perishable food and cash donations) at our summer picnic and our winter holiday party each year. February 2009 Resolution: The members passed a motion requesting that any e-mail messages sent to the ARC e-mail distribution list be sent with names and e-mail addresses hidden, which can be done by sending the message to the members as bcc’s (blind copies).